In the retail box of the Samsung Focus Flash, you will find a charger, a USB cable, an in-ear stereo headset, as well as the usual set of booklets from AT&T, Samsung and Microsoft. The bundled stereo headset is definitely on the cheap side (we’ve seen great earbuds in Samsung retail boxes before). Given the phone’s price tag and the trend of omitting the accessory altogether lately by the carriers, we see no reason to complain. It is better than none at all. In terms of design, the Samsung Focus S is one of the most elegant and understated devices we’ve seen in quite a while. With a black color scheme and a Super AMOLED screen on board, there is practically no telling where the borders of the display are when it is on. Samsung has been going easy on the use of metal even in its top devices. The Focus Flash however, has a metal back cover. The rest of the materials used are Corning Gorilla Glass and high quality plastic. Judging by the build quality and design alone, we can hardly call the smartphone budget oriented. The phone’s measures come at 116 x 59 x 11 mm, and its weight tips the scale at 116 grams. For a modern day smartphone, the device is extremely pocketable. We are already well familiar with the Super AMOLED screen technology. The 3.7” WVGA unit of the Samsung Focus Flash is easily the best screen in its class. 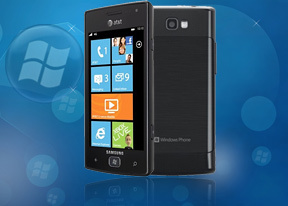 With its deep blacks, high contrast, and superb viewing angles, the display enjoys a perfect relationship with the sleek Metro UI of the Windows Phone 7.5 OS. As a matter of fact, the Microsoft mobile OS is easily the best way to showcase the capabilities of the Super AMOLED technology (and vice versa, too). Below the screen, you will find the Windows home hardware button, surrounded by a thin metal bezel, along with the touch sensitive back and search buttons on its sides. Above the display are the earpiece, the front-facing 1.3MP camera unit, as well as the ambient light and proximity sensors. The volume rocker can be found on the left of the device. Its buttons are sturdily built and easy to access. A tiny latch for removing the battery cover keeps company to the volume rocker. On the right side of the device is the, usual for all Samsung made devices, power/lock button, accompanied by a dedicated camera button. The latter’s presence should make all users of Samsung made, Android devices quite jealous, as it is featured in the budget friendly Focus Flash. The top is a home to the standard 3.5mm audio jack and a secondary microphone for an active noise cancellation. The boot of the Samsung Focus Flash hosts the mouthpiece and the microUSB/charging port. On the back of the device is where the 5MP camera unit and its LED flash reside. The loudspeaker of the smartphone is located on the left side of the camera. The bottom part of the back cover is where the “Windows Phone” sign can be found. Under the paper thin battery cover is where the SIM card and the battery go. Don’t look for a microSD card as the device does not have one. In its latest mobile OS, Microsoft don’t seem too keen on having this ubiquitous for all smartphones feature. The 1500mAh battery of the Focus Flash did a great job in our experience with it. It easily made it through a full day of heavy use. This is as good as most smartphones get these days. The phone’s size and slightly curved back make it a pleasure to handle. The premium materials used in its making only add to the nice feeling.